The sixth edition remains the pioneering text for the practising physician confronted with the unique problems of an increasingly elderly population. Dr William Reichel’s formative text is designed as a practical and useful guide for health specialists from medical students to practicing physicians. This book is not a collection of subspecialty chapters but rather emphasizes the clinical management of the geriatric patient with simple to complex problems. 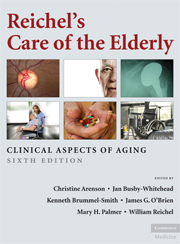 The editors have reviewed every chapter and have included the most up-to-date advances in the care of the elderly. New chapters include hormonal therapy in post-menopausal women, drug therapy for Alzheimer’s sufferers, alternative medicine, the chronic understaffing of nursing homes, management of delirium, and ethical issues. Comprehensive and written for any clinicians caring for older patients (including family physicians, general internists, nurse practitioners, geriatricians, and other specialists), this esteemed text provides practical and trusted advice.